Shanghai in the 1920s and 1930s - ""the Paris of the Orient"" - was both a glittering metropolis and a shadowy world of crime and social injustice. It was also home to Huo Sang and Bao Lang, fictional Chinese counterparts to Arthur Conan Doyle's Sherlock Holmes and Dr. Watson. The duo lived in a spacious apartment on Aiwen Road, where Huo Sang played the violin (badly) and smoked Golden Dragon cigarettes as he mulled over his cases. Cheng Xiaoqing (1893-1976), ""The Grand Master"" of twentieth-century Chinese detective fiction, had first encountered Conan Doyle's highly popular stories as an adolescent. In the ensuing years he played a major role in rendering them first into classical and later into vernacular Chinese. 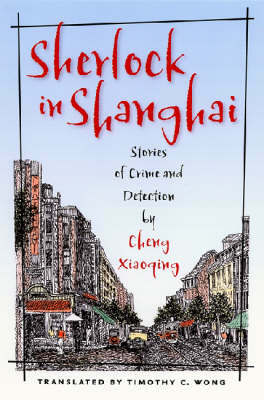 In the late 1910s, Cheng began writing detective fiction very much in Conan Doyle's style, with Bao as the Watson-like-I narrator - a still rare instance of so direct an appropriation from foreign fiction. Cheng Xiaoqing wrote detective stories to introduce the advantages of critical thinking to his readers, to encourage them to be skeptical and think deeply, because truth often lies beneath surface appearances. His attraction to the detective fiction genre can be traced to its reconciliation of the traditional and the modern. In ""The Shoe,"" Huo Sang solves the case with careful reasoning, while ""The Other Photograph"" and ""On the Huangpu"" blend this reasoning with a sensationalism reminiscent of traditional Chinese fiction. ""The Odd Tenant"" and ""The Examination Paper"" also demonstrate the folly of first impressions. ""At the Ball"" and ""Cat's-Eye"" feature the South-China Swallow, a master thief who, like other outlaws in traditional tales, steals only from the rich and powerful. ""A Summer Night's Tragedy"" clearly shows Cheng's strategy of captivating his Chinese readers with recognizably native elements even as he espouses more globalized views of truth and justice.